Authentic Movement is a form of dance/movement psychotherapy that was created by Mary Whitehouse in the 1960s. It is a movement-based exploration into self inquiry that begins when you close your eyes and wait for an impulse from your body to move, allowing your deeper levels of knowledge to guide your experience in movement. Authentic Movement is different from types of stress reduction exercises like yoga, since there is no “direction” given. Instead, there is only gentle listening to allow your body to lead you in your own healing process. 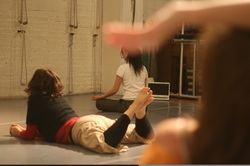 Authentic Movement can be done in a group or as an individual session. Similar to a moving meditation, Authentic Movement is often experienced as a “dropping down” into the self to discover things that we are not readily aware. Authentic Movement is an integrative process that will teach you how to listen and learn from the subtle cues of your body. Authentic Movement increases self-awareness, facilitate creative problem solving and integrate body/mind/spiritual health, while offering the luxurious experience of taking time for yourself to slow down and see what your body is trying to tell you. Your experience can be as profound as deep emotional growth, or as simple as finding a creative solution to a pressing issue or difficult decision. Although Authentic Movement is traditionally conducted as a group experience, I often offer individual sessions to those who are interested in using the practice as a more intensified way to engage in psychotherapeutic healing.